Capable of cutting rebar up to #6 (19mm). The cutter head offers outstanding features, including 360-degree handle rotation, 4-sided cutting Blocks, hand-operated gauge blocks, shock absorbers, and the lightest weight in its class. 23 lbs. Comes complete with 10' of hydraulic hose and quick disconnect coupler. JPU-M4LW; single acting e-pump; 1 HP; 1 Gal; 10,000 psi; 115v 50/60hz universal motor with a 10' corded pendent switch. The universal motor is built for use with generators and extension cords and a very portable light weight of 37 lbs with oil included. Portable Generator; model J-GA36HR; 3600 watts of power; brushless alternator design; GFCI protection; Automatic idle control; shock mounts and wheel kit included. 25 1/2" x 22" x 24 height. 5 Gallon tank and 9 hour run-time. PB5135 Pull Bender bends up to 135 degrees, ACI approved for #5 (16mm) and #4 (13mm) rebar. Bender comes complete with 10' of hydraulic hose and a quick dis-connect coupler. 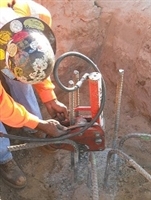 ** Works on rebar spaced 2" on center ** Cylinder is 2.5 tons and a 5" stroke ** Dimensions; 19" x 9" x 3" ** Weight is 22 lbs. JB5090 Jimmy Rebar Bender is ACI approved for #5 radius bending and comes complete with 10' of hydraulic hose and quick-disconnect coupler. Bends up to 90 degrees ** Works on rebar spaced 3" on center ** From the bottom of bender to the bottom of the rebar bend is 4.4" ** Cylinder is 5 tons and a 9" stroke ** Dimensions; 17" x 9" x 4.5" ** Weight is 31 lbs. 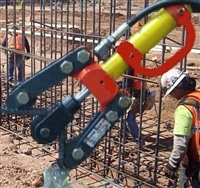 PB7135 Pull Bender bends up to 135 degrees, ACI approved for #7 (22mm) and #6 (19mm) rebar. Bender comes complete with 10' of hydraulic hose and a quick dis-connect coupler. ** Works on rebar spaced 2" on center ** From the deck to the bottom of the rebar bend is 7.3" ** Cylinder is 5 tons and a 5" stroke ** Dimensions; 19" x 9" x 3" ** Weight is 40 lbs. JPU-1-230 e-Pump; Single acting 230v; 15 amps; portable hydraulic pump; 1 hp; 2 Gal tank, 10,000 psi; pendent switch control; 69 lbs. The JB8090 #8 (25mm) JIMMY Rebar Bender is ACI approved for #8 radius bending and is also capable of bending #7 rebar (22mm). Bender comes complete with 10' of hydraulic hose and a quick dis-connect coupler. 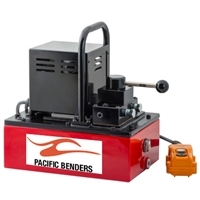 Bends up to 90 degrees ** Works on rebar spaced 3" on center ** Straightens up to #9 rebar (less than 30 degrees) ** From the bottom of bender to the bottom of the rebar bend is 7" ** Cylinder is 10 tons and a 14" stroke ** Dimensions; 19.3" x 12" x 4.7" ** Weight is 40 lbs.